The heart and soul of Algonquin Outfitters is found at our original store in Oxtongue Lake, opened in 1961. A lot has changed since that day but, in some ways, a lot has not. The Oxtongue Lake base maintains the largest selection of outfitting equipment, canoes and camping supplies. Canada’s largest light weight rental canoe fleet is hosted here, along with a wide selection of kayaks and even four 26′ Voyageur canoes for group outings. With a wide range of camping equipment, canoeing gear and accessories in the rental program, the Oxtongue Lake store is set up to outfit almost any wilderness adventure. Our main outfitting base is located just outside the western entrance to Algonquin Park. The resort community of Oxtongue Lake is near the village of Dwight, about 20 minutes from Huntsville on Highway 60. Established in 1961 by Bill Swift Sr. and his family, the store is centrally located to canoe route access points both along Highway 60 and on the west side of the park. Additionally, it is the home of the Swift Canoe Company’s Algonquin Canoe Store, where a wide variety of canoe models are available for sale and test paddling. Spring: May 1st to First Saturday in July. * Closed Tuesdays and Wednesdays in November until the third week of Dec.
We are open on all holidays in the summer season. One little secret that most people don’t know is, there’s 15km of groomed and track set Nordic Ski Trails and nearly 10 km of multi use snowshow trails right at our Oxtongue Lake store. 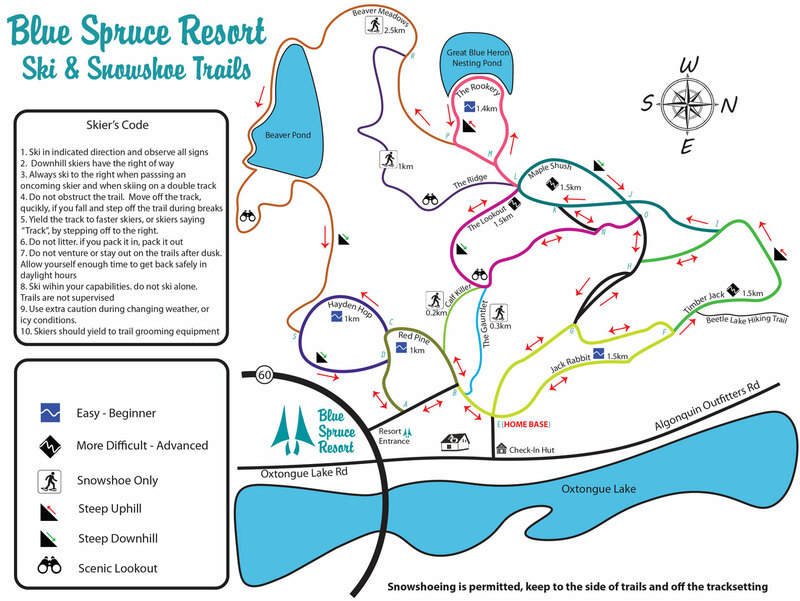 Our friends and neibours at the Blue Spruce Resort maintain these trails right behind our Oxtongue Lake store. If your looking for a place to stay the area you should really check them out online at www.bluespruce.ca.